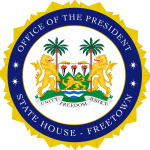 State House, Freetown, Monday 20 August 2018 – His Excellency President Julius Maada Bio has officially launched the free quality pre-primary, primary and secondary education for government and government assisted schools starting 17 September 2018. He averred that education was an investment for personal and national development, the foundation of moral regeneration, a revival of the people as well as a strong pillar for the nation’s industries. He added that without quality education a nation cannot get the much-needed manpower for socio-economic advancement. President Bio mentioned that in their early lives students should realise the importance of education and that it was imperative on parents to show their children that education was the ticket to fulfilling dreams as well as having a productive life. He, therefore, used the opportunity to call on teachers and parents to support the free education programme, adding that his government would take legal actions against parents who failed to send their children to school.